The [simple carbon project] model v1.0 (SCP-M) was constructed for simulations of the paleo and modern carbon cycle. 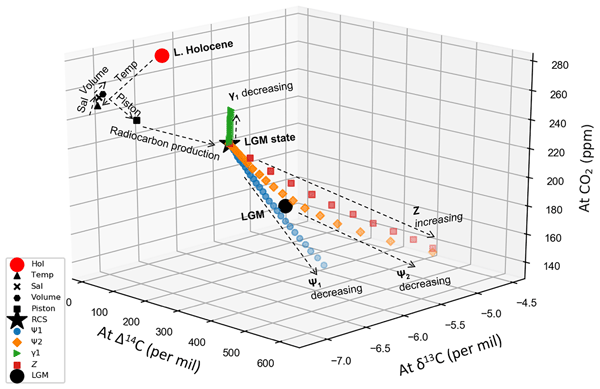 In this paper we show its application to the carbon cycle transition from the Last Glacial Maximum to the Holocene period. Our model–data experiment uses SCP-M's fast run time to cover a large range of possible inputs. The results highlight the role of varying the strength of ocean circulation to account for large fluctuations in atmospheric CO2 across the two periods. 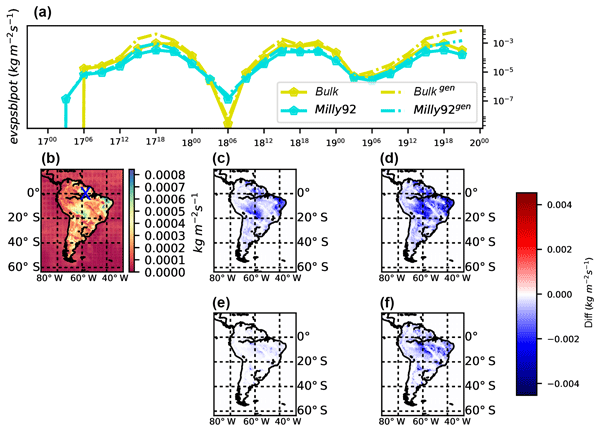 We introduce a new set of algorithmic tools capable of producing scalable, low-rank decompositions of global spatiotemporal atmospheric chemistry data. 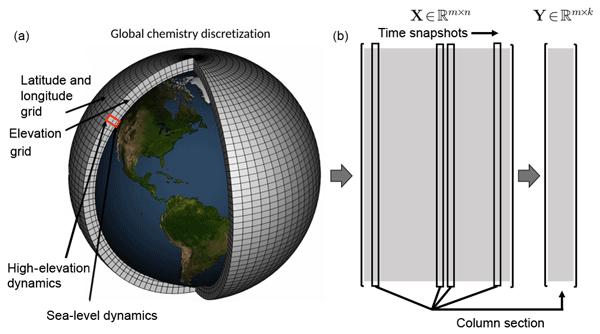 By exploiting emerging randomized linear algebra algorithms, a suite of decompositions are proposed that efficiently extract the dominant features from global atmospheric chemistry at longitude, latitude, and elevation with improved interpretability. 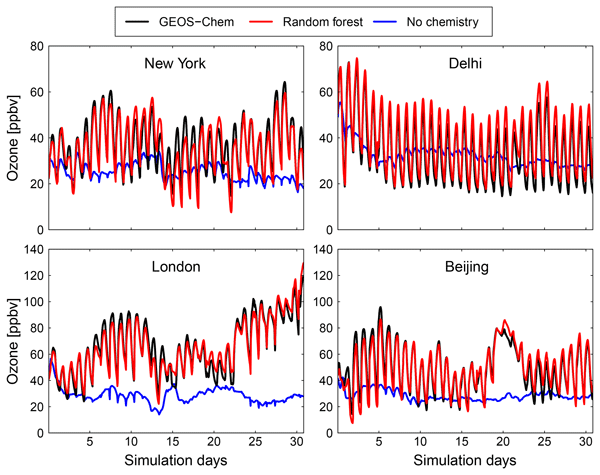 The algorithms provide a strategy for the global monitoring of atmospheric chemistry. Dust storms have thought to be a worldwide societal issue and numerical modeling is an effective way which can help to predict dust events. Here we present the first comprehensive evaluation of multi-model simulations of windblown dust emissions in East Asia. The results showed that most of these models were able to capture this dust event and indicated the dust source maps should be carefully selected or replaced with a new one constructed with local data. Earth system models (ESMs) produce the highest-quality future climate data available, but they are costly to run, so only a few runs from each model are publicly available. What is needed are emulators that tell us what would have happened, if we had been able to perform as many ESM runs as we might have liked. Much of the existing work on emulators has focused on deterministic projections of average values. Here we present a way to imbue emulators with the variability seen in ESM runs. We present a suite of nine scenarios of future emissions trajectories of anthropogenic sources for use in CMIP6. Integrated assessment model results are provided for each scenario with consistent transitions from the historical data to future trajectories. We find that the set of scenarios enables the exploration of a variety of warming pathways. A wide range of scenario data products are provided for the CMIP6 scientific community including global, regional, and gridded emissions datasets. Soils in cold regions store large amounts of carbon that could be released to the atmosphere if the soils thaw. To best simulate these soils we explored different configurations and parameterizations of the CLASS-CTEM model and compared to observations. The revised model with a deeper soil column, new soil depth dataset, and inclusion of moss simulated greatly improved annual thaw depths and ground temperatures. 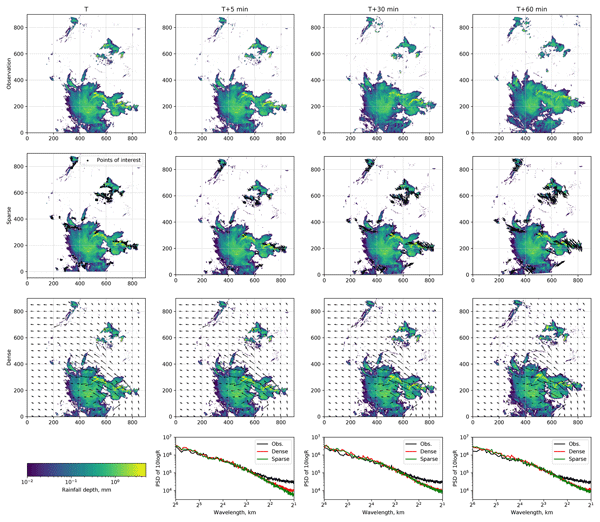 We estimate sub-grid scale features limit further improvements against observations. We use Kokkos, a C++ library for on-node parallelism, to achieve a performance-portable implementation of HOMME, the atmosphere component of the Earth Energy Exascale System Model. The increasing diversity of high-performance computing (HPC) architectures and the demand for higher resolutions create new challenges when writing efficient code. With Kokkos, we obtain a single code base that performs well on current HPC platforms and enables portable performance to future HPC architectures. This paper describes the implementation of a sectional aerosol module, SALSA, into the PALM model system 6.0. The first evaluation study shows excellent agreements with measurements. 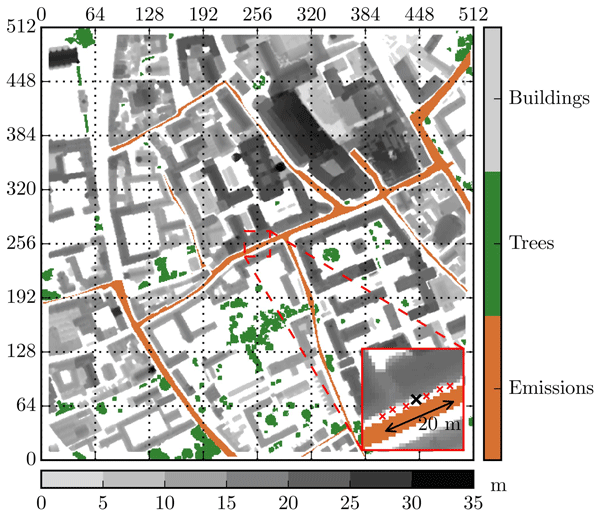 Furthermore, we show that ignoring the dry deposition of aerosol particles can overestimate aerosol number concentrations by 20 %, whereas condensation and dissolutional growth increase the total aerosol mass by over 10 % in this specific urban environment. We present LaVEnDAR, a mathematical method for combining observations with models of the terrestrial environment. Here we use it to improve estimates of crop growth in the UK Met Office land surface model. However, the method is model agnostic, requires no modification to the underlying code and can be applied to any part of the model. In the example application we improve estimates of maize yield by 74 % by assimilating observations of leaf area, crop height and photosynthesis. we developed the Real-time On-road Emission (ROE v1.0) model to obtain the street-scale on-road hot emissions by using real-time big data for traffic provided by the Gaode map navigation application. The results are close to other emission inventories. Meanwhile, we applied the applied our results to street-level air quality model for studying the impact of the national holiday traffic volume change on air quality. The model can be further extended to more districts in China or other countries. The Lagrangian particle dispersion model FLEXPART-AROME was build to study air-mass transport around La Réunion, a volcanic island in the South West Indian Ocean. To harmonise turbulent transport between the numerical weather prediction model and the transport model, turbulent kinetic energy from AROME is directly used in FLEXPART-AROME using discrete interfaces between different turbulent regions. 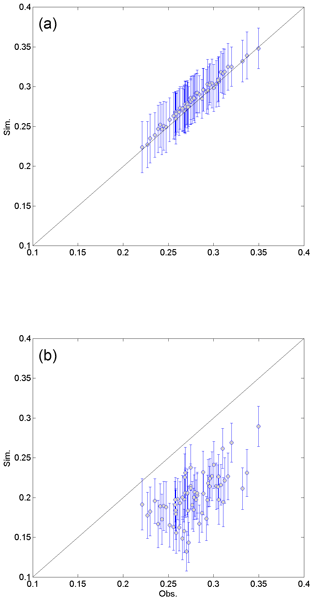 An adaptive time step was implemented to satisfy physical constraints on turbulent transport. How much will it rain within the next hour? To answer this question, we developed rainymotion – an open source Python software library for precipitation nowcasting. In our benchmark experiments, including a state-of-the-art operational model, rainymotion demonstrated its ability to deliver timely and reliable nowcasts for a broad range of rainfall events. This way, rainymotion can serve as a baseline solution in the field of precipitation nowcasting. Investigation of COSMO-CLM 5.0 sensitivity for the CORDEX Central Asia domain, with the main goal of proposing a model optimal configuration for the area, to be used in projection studies. Results show that the model seems to be particularly sensitive to those parameterizations that deal with soil and surface features, and that could positively affect the repartition of incoming radiation. We present the atmospheric chemistry box model CAABA/MECCA which now includes a number of new features: skeletal mechanism reduction, the MOM chemical mechanism for volatile organic compounds, an option to include reactions from the Master Chemical Mechanism (MCM) and other chemical mechanisms, updated isotope tagging, improved and new photolysis modules, and the new feature of coexisting multiple chemistry mechanisms. 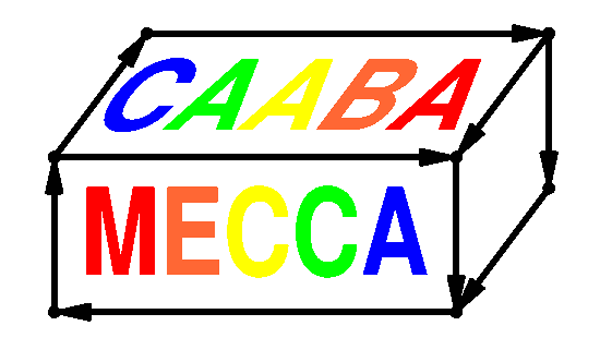 CAABA/MECCA is a community model published under the GPL. 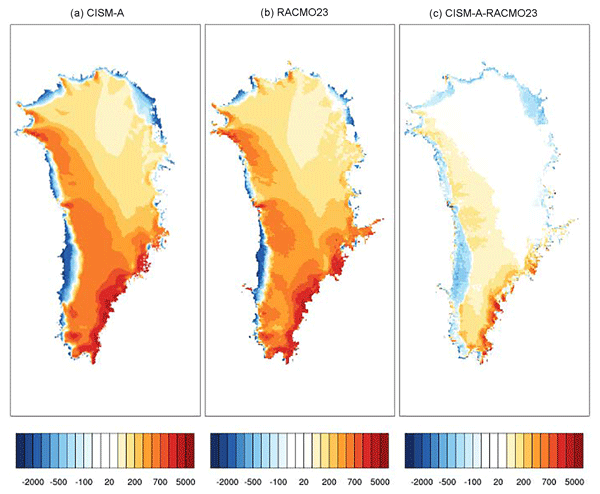 A comparative assessment of the uncertainties of global surface­-ocean CO2 estimates using a machine learning ensemble (CSIR-ML6 version 2019a) – have we hit the wall? The ocean plays a vital role in mitigating climate change by taking up atmospheric carbon dioxide (CO2). Historically-sparse ship-based measurements of surface ocean CO2 make direct estimates of CO2 exchange changes unreliable. We introduce a machine learning ensemble approach to fill these observational gaps. Our method performs incrementally better relative to past methods, leading to our hypothesis that we are perhaps reaching the limitation of machine learning algorithms' capability. Methane is an important greenhouse gas naturally produced in wetlands (areas of land inundated with water). 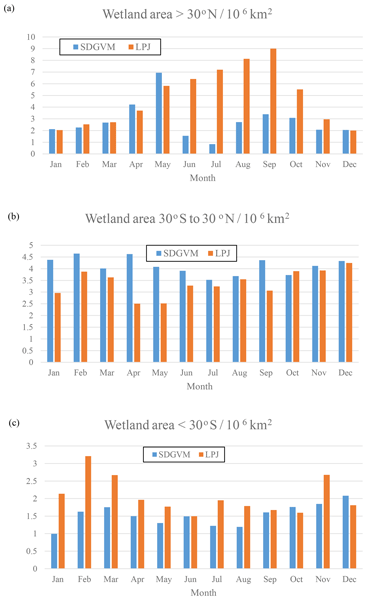 Models of the Earth's past climate need estimates of the amounts of methane wetlands produce; and in order to calculate those we need to model wetlands. In this work we develop a method for modelling the fraction of an area of the Earth that is wetland, repeat this over all the Earth's land surface and apply this to a study of the Earth as it was around 50 million years ago. Models need to account for forest age-structures when investigating land use influences on land-atmosphere feedbacks. We present a consolidated scheme to introduce forest age-classes, combining age-dependent simulations of important processes with the possibility to trace forest age, and describe its implementation in JSBACH4, the land surface model of the ICON Earth system model. We evaluate simulations with and without age-classes demonstrating the benefit of forest age-classes in JSBACH4. Future changes in Earth system state will impact agricultural yields and therefore the global economy. Global gridded crop models estimate the influence of these Earth system changes on future crop yields, but are often too computationally intensive to dynamically couple into global multi-sector economic models, such as GCAM and other similar-in-scale models. This work describes a new crop yield change emulator, Persephone, that can capture yield changes in a computationally efficient way. 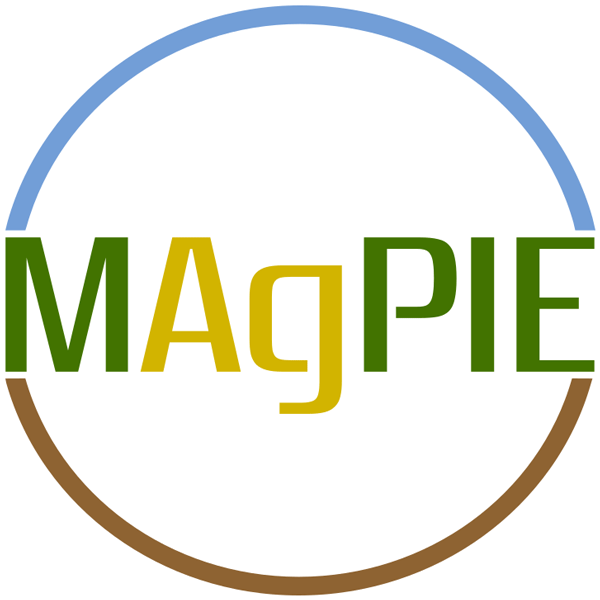 We provides an overview on version 4 of the MAgPIE open-source framework for modeling global land systems. 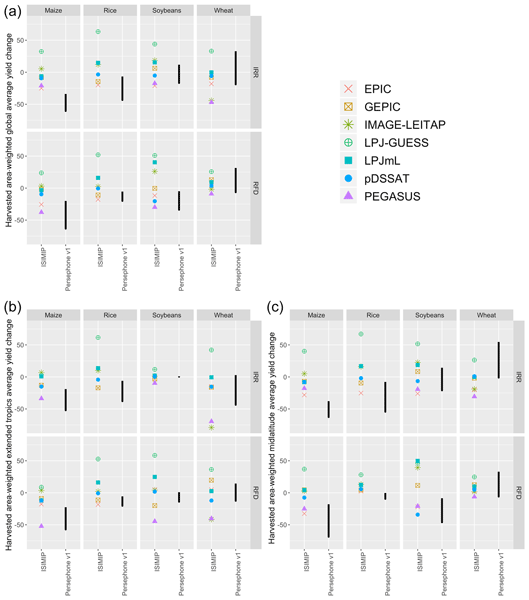 Among others, MAgPIE has been used to simulate marker scenarios of the Shared Socioeconomic Pathways (SSPs) and contributed substantially to multiple IPCC assessments. Its recent version marks the first open-source release of the framework and introduces several new features. Via its modularity and spatial flexibility it can serve as a tool for a broad range of land-related research topics. We present a novel set of atmospheric simulations designed to address changes in high-impact weather events. We simulate ten years under current and projected late 21st-century climate conditions. 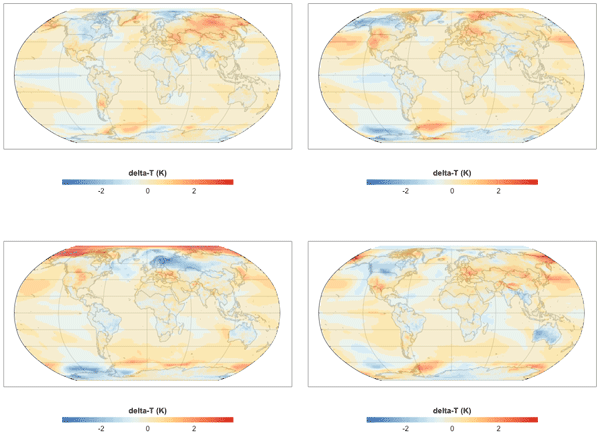 Our model reasonably replicates present-day climate features, reproduces features of climate change that are expected from global climate models, and captures smaller scale, high-impact weather events. We anticipate these simulations will have great value in understanding changes in extreme weather. The novel multi-model EURODELTA-Trends exercise provided 21-year of continuous PM components and their gas-phase precursors concentrations over Europe from the year 1990. The models’ capabilities to reproduce PM components and gas-phase PM precursors trends over the 1990–2010 period is the key focus of this study. The models were able to reproduce the observed trends relatively well, indicating a possible shift in the thermodynamic equilibrium between gas and particle phase. 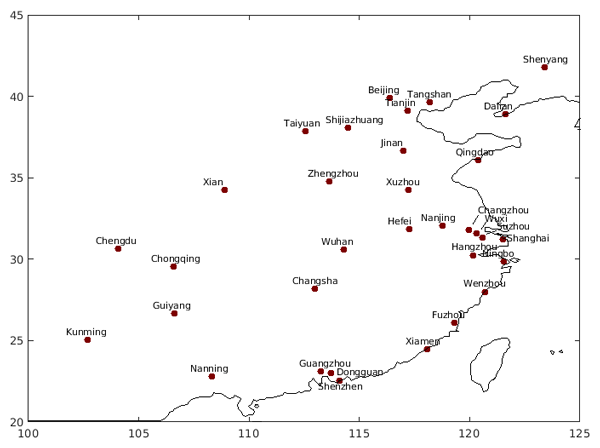 An operational multi-model forecasting system for air quality is providing daily forecasts of ozone, nitrogen oxides, and particulate matter for 37 urban areas of China. The paper presents the evaluation of the different forecasts performed during the first year of operation. To predict the response of the vegetation to climate change, we need global models that describe the processes taking place in the vegetation. Recently we have obtained more in-depth understanding of vegetation dynamics and the role of nutrients in the biogeochemical cycles. We have developed a new global vegetation model, that includes carbon, water, nitrogen and phosphorus cycles. We show that the model is successful in evaluation against a wide range of observations. We have developed an openly accessible web-based platform for visualization and promotion of easy access to one dimensional hydrodynamic lake model output data updated in near real time ( https://simstrat.eawag.ch/). This platform was developed for 54 lakes in Switzerland with potential for adaptation to other regional areas or even at global worldwide scale using appropriate forcing input data. Computer simulations of atmospheric chemistry are a central tool to study the impact of air pollutants on the environment. These models are highly complex and require a lot of computing resources. In this study we show that machine learning can be used to predict air pollution with an accuracy that is comparable to the traditional, computationally expensive method. 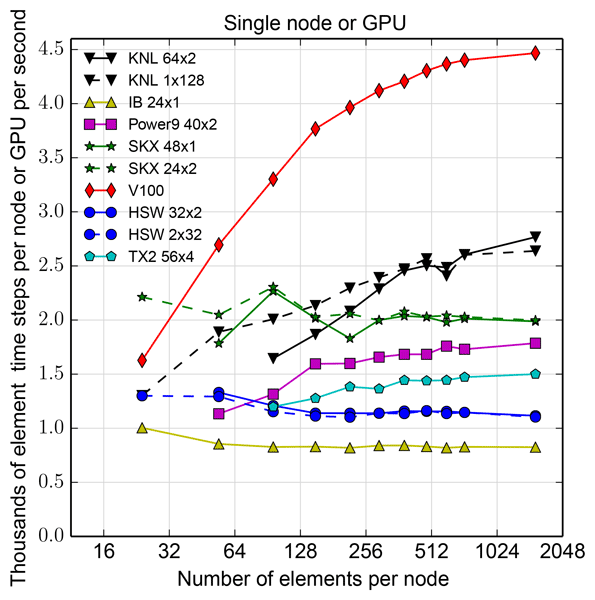 Such a machine-learning-based model has the potential to be orders of magnitude faster. Two developments are made to the United Kingdom Chemistry and Aerosols (UKCA) model to improve simulation of stratospheric ozone. The first is the addition of a solar cycle. The influence on ozone from the solar cycle is found to be 1–2 %, which is consistent with other studies. The second is to the heterogeneous chemistry, the most significant change being the addition of reactions involving bromine species. This was shown to reduce ozone biases relative to observations in most regions. 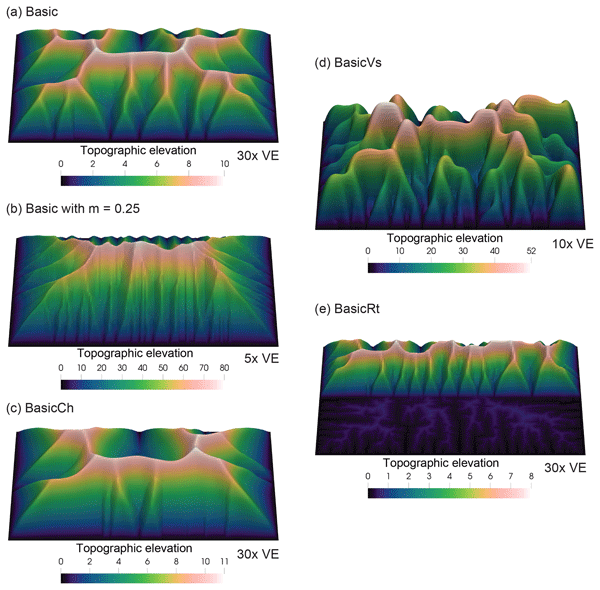 The paper covers the description of a 3-D open source model that dynamically couples the biophysical interactions between submerged aquatic vegetation (SAV), hydrodynamics (currents and waves), sediment dynamics, and nutrient loading. Based on SAV growth model, SAV can grow or dieback while contributing and sequestering nutrients from the water column (modifying the biological environment), and subsequently affect the hydrodynamics and sediment transport (modifying the physical environment). A simple novel technique for simulating multisite occurrence of precipitation is proposed. The proposed technique employs the nonparametric approaches k-nearest neighbor and genetic algorithms. We tested this technique in various ways and proved that this simple technique can be useful and comparable to the existing one. 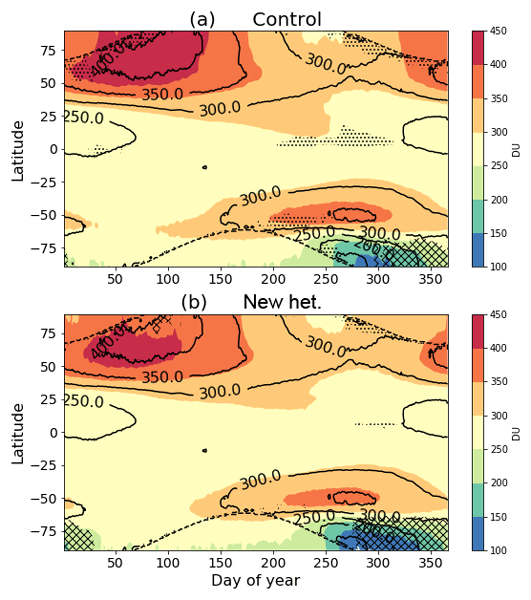 The representation of clouds was significantly improved in the climate model MRI-ESM2. The model is planned for use in the sixth phase of the Coupled Model Intercomparison Project (CMIP6) simulations. In particular, a notorious lack of reflection of solar radiation over the Southern Ocean was drastically improved in the model. The score of the spatial pattern of radiative fluxes for MRI-ESM2 is better than for any CMIP5 model. We present modifications implemented in the various physics schemes. Analog methods rely on the principle that similar atmospheric situations are likely to result in similar local effect, such as precipitation. By using archives of measured atmospheric parameters and observed precipitation, one can establish a probabilistic forecast for example of the precipitation for a chosen target day. 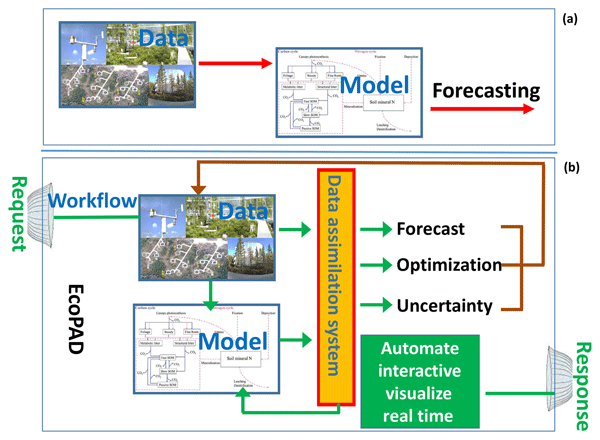 Analog methods require low computing capacity and have demonstrated a useful potential for application both in operational forecasting and in the context of climate studies. The Ecosystem Demography Model calculates the fluxes of heat, water, and carbon between plants and ground and the air, and the life cycle of plants in different climates. To test if our calculations were reasonable, we compared our results with field and satellite measurements. Our model predicts well the extent of the Amazon forest, how much light forests absorb, and how much water forests release to the air. However, it must improve the tree growth rates and how fast dead plants decompose. We develop a Bayesian mixing model to address the issue of small sample sizes to describe different sources in hydrological mixing applications. Using composite likelihood functions, the model accounts for an often overlooked bias arising due to unweighted mixing. We test the model efficacy using a series of statistical benchmarking tests and demonstrate its real life applicability by applying it to a Swiss Alpine catchment to obtain the proportion of groundwater recharged from rain vs. snow. We measure how computational performance of global FESOM2 ocean model (formulated on unstructured mesh) changes with the increase of the number of computational cores. We find that for many components of the model the performance increase linearly, but identify two bottlenecks - sea ice and ssh submodules. We show that FESOM2 is on par with the state of the art ocean models in terms of throughput, that reach 16 simulated years per day on eddy resolving configuration (1/10 degree). Our paper describes the Ecosystem Demography Model. This computer program calculates how plants and ground exchange heat, water, and carbon with the air, and how plants grow, reproduce and die in different climates. Most models simplify forests to an average big tree. We consider that tall, deep-rooted trees get more light and water than small plants, and that some plants can with shade and drought. This diversity helps us to better explain how plants live and interact with the atmosphere. Here we suggest that in addition to reproducing observed time series of climate variables within required accuracy a model should also exhibit the causality relationship between variables found in nature. Specifically, we propose a novel framework for a comprehensive analysis of climate model responses to external natural and anthropogenic forcing based on the method of conditional dispersion. Predicting future changes in ecosystem services is not only highly desirable but is also becoming feasible as several forces are converging to transform ecological research into quantitative forecasting. To realize ecological forecasting, we have developed an Ecological Platform for Assimilating Data (EcoPAD) into models. EcoPAD also has the potential to become an interactive tool for resource management, stimulate citizen science in ecology, and transform environmental education. The Polar Amplification Model Intercomparison Project (PAMIP) is an endorsed contribution to the sixth Coupled Model Intercomparison Project (CMIP6). It will investigate the causes and global consequences of polar amplification through coordinated multi-model numerical experiments. This paper documents the experimental protocol. 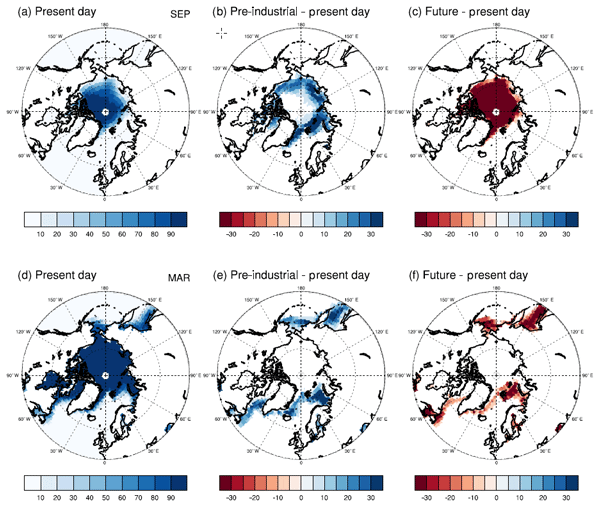 Few Earth System models represent permafrost soil biogeochemistry, contributing to uncertainty in estimating its response, and that of the planet to warming. Because the permafrost contains over double the carbon in the present atmosphere, its fate as it is 'unlocked' by warming is globally significant. One way that it can be mobilised is into rivers, then sea or atmosphere: a vector previously ignored in climate modelling. We present a model scheme for resolving this vector at global scale. In this 2nd part of a 2-part study, we perform simulations of the carbon and water budget of the Lena catchment with the land surface model ORCHIDEE MICT-LEAK, enabled to simulate dissolved organic carbon (DOC) production in soils and its transport and fate in high latitudes inland waters. We compare simulations using this model to existing data sources to show that it is capable of reproducing dissolved carbon fluxes -of potentially great importance for the future of the global permafrost. Emissions from wildland fires can cause significant impacts to regional air quality. In this work, we introduce a new wild fire emissions modelling system and demonstrate its integration with an operational air quality forecast system to provide near-real-time guidance of surface air pollutants concentrations (PM2.5, O3 and NO2) from the impacts of regional wildland fires across the North American model domain. In this article, we describe the new ECMWF seasonal forecast system, SEAS5, which replaced its predecessor in November 2017. We describe the forecast methodology used in SEAS5 and compare results from SEAS5 to results from the previous seasonal forecast system, highlighting the strengths and weaknesses of SEAS5. 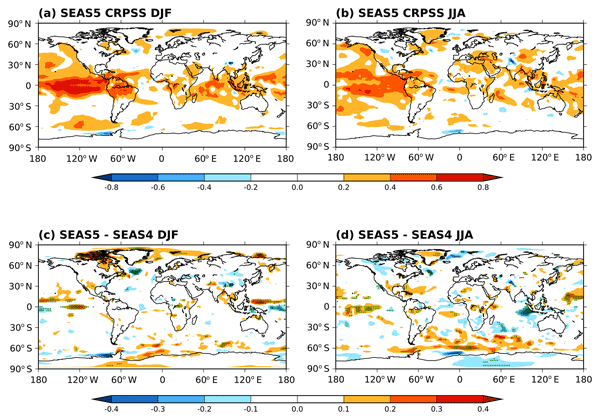 SEAS5 data are publicly available through the Copernicus Climate Change Service's multi-system seasonal forecast. 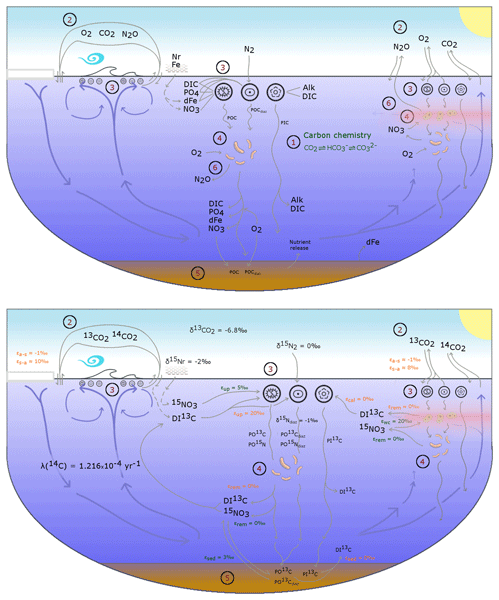 Lake physical processes occur at a wide range of spatio-temporal scales. 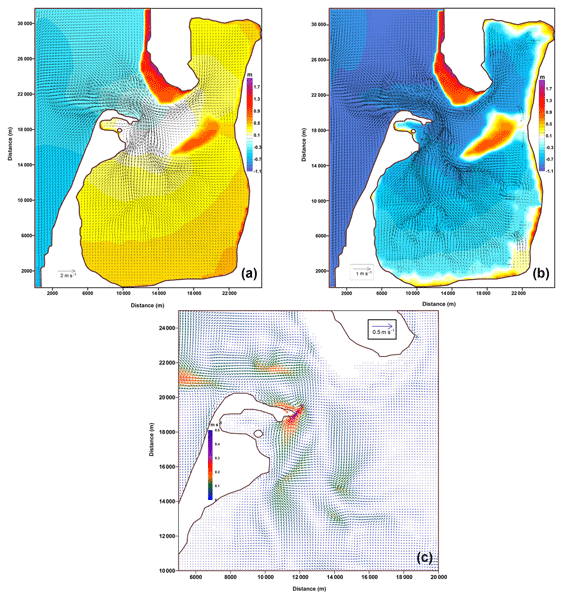 3D hydrodynamic lake models are the only information source capable of solving those scales, however they still need observations to be calibrated and to constrain their uncertainties. The optimal combination of 3D hydrodynamic model, in-situ measurements and remote sensing observations is achieved through data assimilation. Here we present a complete data assimilation experiment for lakes using open source tools. A Python-enhanced urban land surface model, SuPy (SUEWS in Python), is presented with its development (the SUEWS interface modification, F2PY configuration and Python frontend implementation), cross-platform deployment (PyPI, Python Package Index) and demonstration (online tutorials in Jupyter notebooks for users of different levels). SuPy represents a significant enhancement that supports existing and new model applications, reproducibility, and enhanced functionality.